Control: General crawling insects, resting flying insects. 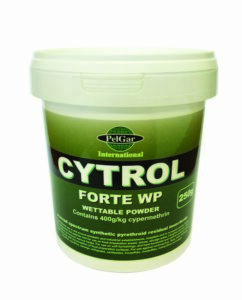 One of the ‘flag-ship’ products of the PelGar range, Cytrol Forte is a high strength wettable powder, containing the powerful synthetic pyrethroid cypermethrin. This has excellent insecticidal qualities and good ‘flushing’ and ‘knock-down’ effect. The formulation provides extremely good control on difficult surfaces where exceptionally long residual life is required. Due to the high strength of the formulation, staining of the treated surface, which can be common with other wettable powders, does not occur with Cytrol Forte. Wettable powders are formulated to provide exceptional residual control. The active ingredient is mixed or adsorbed onto a mineral filler (depending whether the active is a liquid or solid at ambient temperatures). Dispersants and surface-active agents are added so that the formulation can be diluted, suspended, or dispersed in water for ease of application. This formulation type is especially useful for the treatment of highly absorbent surfaces such as brick, mud or some wood. After application, the active ingredient (and filler) is left on the surface as a microscopic, insecticidally active powder, that is readily picked up when an insect walks over it.